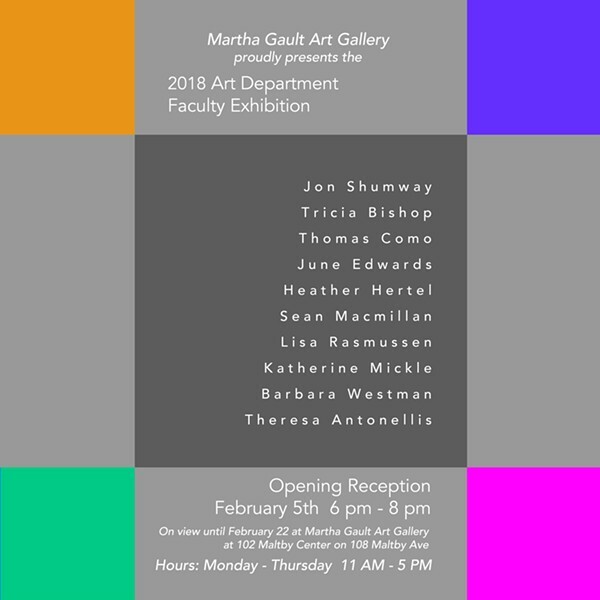 The Martha Gault Art Gallery proudly presents recent and retrospective artworks by Professors of the Slippery Rock University Art Department. Contemporary artworks in a variety of media including ceramics, drawings, paintings, prints, photography and sculptures by Tricia Bishop, Thomas Como, June Edwards, Heather Hertel, Sean Macmillan, Katherine Mickle, Lisa Rasmussen, Jon Shumway, Barbara Westman and Theresa Antonellis. Opening reception Feb. 5, 6-8 p.m.